Originally certified with another organization she saw a need for a very specific way to access the Akashic Records. Her work with the Flower of Life MerKaBa Meditation led her to develop a tool for Higher Self Connection, which opened the Records in a very unique way. Maureen realized that she could abandon her 3D approach, and move into her Higher Self first, accessing the “Records” from a place of non-duality. Founding the Akashic Records International (ARI) fulfilled the mission she was given of teaching her method to others. 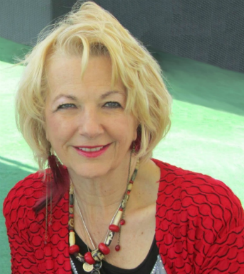 In 2009 Maureen founded Akashic Records Guides (ARI) to provide training and camaraderie for devoted, talented individuals to learn to access their own records from this place of non-duality, plus a certification program to train you to read for others! Maureen can assist you to access the wisdom of your own Record Keepers who can guide you and provide you with insights, direction and more. Sessions are by appointment only. 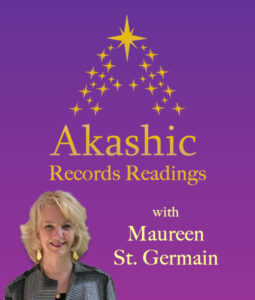 Most Akashic Record readings are done by phone or Skype, since Maureen has an international clientele. All readings are 50 minutes in length and can be recorded. In-person readings are only available by special arrangement. How did I come to be a messenger of the Akashic Records? In 2004 I was given access to a dimension that had been closed to humanity for eons. I actually wasn’t seeking it at the time. Yet, I know that I am a seeker and a teacher. My life is one of continual prayer for humanity’s enlightenment and enlightenment for myself as well. I am a clear channel from Source, and of Source light and love to all who seek my services. Yet it is only in hindsight that I actually understood and became aware of the fact that I had divine contract to do Akashic Records work! It began when I received a message in a lucid dream. I was in Atlanta and waiting in the car for my host after a full day of workshops. I was ready for dinner, but had drifted off to sleep. I came out of the dream with a very clear message. At the time I was told that a well-known astrologer (also in Atlanta) had a message for me. I reached out to her by phone and spoke with her husband, informing him of this announcement. When we finally spoke following day, she informed me that she didn’t transmit messages from her guides for other people, even though her guides often gave her messages for herself. However when she asked her guides if she should update my birth chart, she was told, “Absolutely not, we have a message for her.” This was the exact wording they had given me! This astrology friend re-emphasized to me during our conversation later that day that she never receives messages for other people and was quite surprised herself. Her own Angels and Guides that she used for her personal work had a number of findings in a message for me! First and most importantly, I was being given access to a dimension that has been closed to humanity for eons. What’s more, I was being granted a permanent guide along with other messages that were a more personal nature. Why, I asked my Angels and guides, would such a message come through someone I talk to maybe once or twice a year? The answer was simple and clear: “You would not have believed this if we had given this message to you directly.” I knew how right they were. I’ve always been opposed to aggrandizement and self-important teachers. I was reminded that it was because of that concern that I would’ve dismissed any message such as this is being out of the ego-mind. As a young woman I read everything I could find on the Akashic Records. Edgar Cayce, famed American psychic from the early 1900, channeled about them. I joined my first “Search for God” Cayce study group in 1980. Today I sit on the Board of Trustees for Edgar Cayce Center of New York. I also studied with another organization that taught about the Akashic Records. I was immediately given precise and clear information about what was needed to amend in my own materials and method of how to access the Records. Still, I was reluctant to venture out on my own. Yet Spirit would make arrangements for me. As I progressed in my own Akashic Records knowledge, I was directed to found Akashic Records International. As I began my service opening the Akashic Records for others, I became aware that much of the information that I’d been delivering in in the classroom stemmed directly from the Akashic Records as well. Many of my students would listen to me, saying that I was channeling information from Source before I actually realized the validity of this! I look forward to being your guide on this magnificent journey into your Akashic Records.